Emma Davie wrote this for the Campfire Stories event at the True/False Film Fest, where filmmakers gather around a 'campfire' to swap tales of the scene that got away. It was the tape we didn't want to look at. For weeks it lay in a shoe box under the edit suite. Unseen, unlogged, undigitised. It was not long after Neil, our friend and main character, had died, and Morag and I had started editing the footage ourselves. It was very raw to see again how he had struggled. We often got upset and wanted to stop but we felt we had work to do. Neil had a Yorkshire no-nonsense approach to his own suffering so we also tried to "man up" as he'd say and get on with it. We wanted to get a sense of how the film might work, how we could mingle his voice with his written words, if we could rise above the incredible suffering he went through to produce a universal story. We worked silently. Me at the edit suite, Morag beside me. We had a good understanding of what each other thought so didn't really have to say much about how we worked – or about our attitude to the tape in the shoe box under the table. We just knew we'd carry on avoiding it for as long as possible. Starting today, on the anniversary of Neil Platt's death, we're re-publishing his original blog posts chronicling his struggle against Motor Neurone Disease (as seen in I AM BREATHING). We're going to share them over 100 days in the run-up to 21 June 2013, the Global Awareness Day for MND/ALS which is also our day for worldwide screenings of the film. Louise, who was Neil's wife, has written this wonderful introduction and will add some context to the posts over time, starting today with his very first entry, "Are you sitting comfortably...?" In the meantime, I AM BREATHING keeps touring film festivals, playing at ZagrebDox this Tuesday, having its North American premiere at True/False this Thursday, and showing at Tempo in Stockholm next week. Please keep spreading the word. In Helsinki, I AM BREATHING played first in the Andorra cinema – the one founded by the great Finnish directors Mika and Aki Kaurismäki. Some who have seen our film say Neil's humour is Kaurasmäki-like. A welcome Finnish compliment. After the screenings, audience members offer to show the film on the Global Awareness Day for MND/ALS, even though it will coincide with Midsummer when every Finn goes wild in the country. Others say after the film they went and had a beer “for Neil”. Sometimes I feel sharing this film with an audience is more of a séance than a screening. In that dark space of the cinema, Neil seems to come to life beyond the film itself. He is almost alarmingly present in a way which surprises me. "Best of 2012" & "A Doc to Watch in 2013"
Within weeks of our world premiere at the International Documentary Film Festival in Amsterdam in November, I AM BREATHING has both been called one of the best documentaries in 2012 and one of the films to watch in 2013. The Hollywood Reporter ranked it "among the year's most moving films" (full review here). "As [Neil Platt] promises very early on, what we get is 'a tale of fun and laughs with a smattering of upset and devastation.' The former gives way to the latter only in the closing fifteen minutes or so, when the deterioration in Neil's condition results in his being relocated from his home to a hospice institution. His formidable powers of communication are by this stage ebbing away in a manner that nearly all viewers will find powerfully harrowing. "Necessarily tough going, these sequences deliver what are in effect a series of knockout punches that leave us dazedly counting our blessings. But so firmly have Neil's particular wishes expressed - that he wants the film to promote awareness of MND and encourage fund-raising into the research of possible cures - that I Am Breathing never feels in any way intrusive or exploitative." Today, Shinya Yamanaka receives the 2012 Nobel Prize in Physiology or Medicine for his work on induced pluripotent stem cells (iPS cells, as opposed to controversial embryonic stem cells). As part of his Nobel Lecture at Karolinska Institutet in Stockholm, Professor Yamanaka used Motor Neurone Disease as an example for a pharmaceutical in-vitro application of iPS cells. "[MND patients] become unable to move – and in the end, they become unable to breathe. So it's a very, very sad situation for patients and the family members. Despite numerous efforts by numerous scientists we still don't have effective drugs for these patients suffering from Motor Neurone Disease, primarily because we don't have a good disease model to perform drug screening. 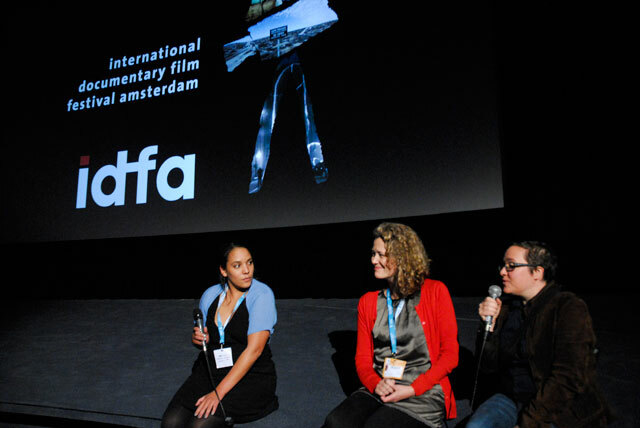 For everybody who wasn't able to come to the first two screenings at IDFA in Amsterdam where the filmmakers were present, here is a video of a question & answer session with directors Emma Davie and Morag McKinnon; Louise Platt who was Neil's wife; and producer Sonja Henrici. It was recorded after the second public screening on Sunday. At the world premiere of I AM BREATHING in Amsterdam, filmmakers Emma Davie and Morag McKinnon (pictured) together with producer Sonja Henrici announced plans for an outreach campaign leading to a Global Screening Day of the documentary on 21 June 2013, coinciding with the Global MND/ALS Awareness Day. Neil Platt was all too aware that one of the major preventatives to finding a cure for MND was lack of funding for research. Neil had lost both his grandfather and his father to the same strain of familial MND that he then suffered from. Following his diagnosis he began a campaign to raise awareness and ultimately funding for MND. He wanted the film, the website, his blog and all the other publicity that he tirelessly committed to before he died to create a storm around MND which would result in further research. Emma and Morag have created this film for Neil, and we want to use it to begin a dialogue with the thousands of people that Neil intended to reach out to. You can help make it happen. Please consider making a contribution on our secure page, also directly supporting the work of the MND Association. With the world premiere of I AM BREATHING just around the corner, we were delighted to discover that MND Scotland are hosting a daring fundraiser on the very same day in Glasgow.